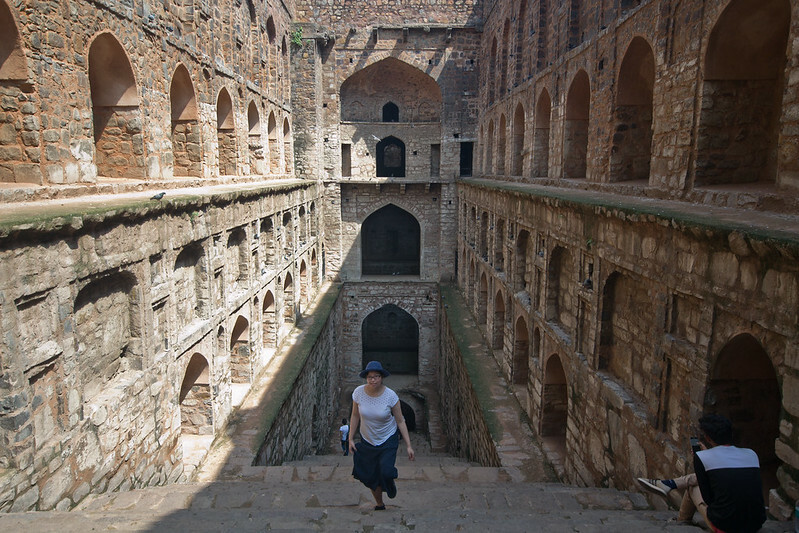 The first time I ever saw a stepwell was on an episode of The Amazing Race. I remember thinking to myself “wow, that place looks amazing”. I don’t remember the exact specifics of the task but I remember the teams we’re trying to find something or someone and they were running up and down the steps trying to make it happen. Never in a million years did I ever think I would be able to visit one of these places in real life, but I did when I was in New Delhi. So surreal to see those skyscrapers in the background. 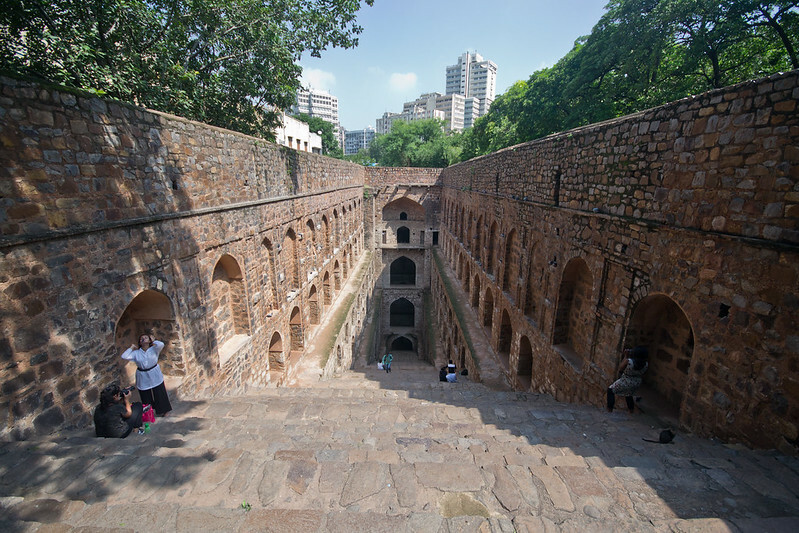 Hidden among the streets near Connaught Place in New Delhi is Agrasen Ki Baoli (or officially Ugrasen ki Baoli), a stepwell protected monument by the Archaeological Survey of India. Running 60 meters long and 15 meters wide, the step well is an impressive architectural structure. The entrance into the stepwell. Looking at it from the outside, you really have no idea what lays inside. Walking into it and seeing it in person, all I could think was oh wow, oh wow, oh wow. Our guide told us that this was a surprise and didn’t tell us where we were going which made my first impression of it even better. Even though this isn’t as large as some of the stepwells I’ve spotted online, it’s still incredibly impressive to look at it in person. 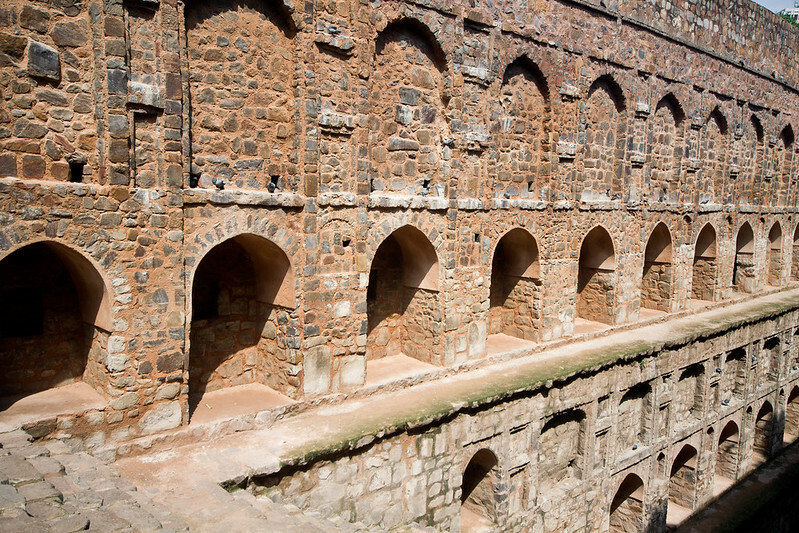 A stepwell is exactly what the name says it is – a series of steps leading down into a well structure. Historically, they served as a place for people to come to collect drinking water or bath especially during months where access to water was difficult and limited. Its design is genius in a way. The steps allow you access to the water below in dry months. However, during monsoon season, those same steps allow for more water to collect. At one point these stepwells were found everywhere, but over the years many of them were forgotten and have fallen into disrepair. 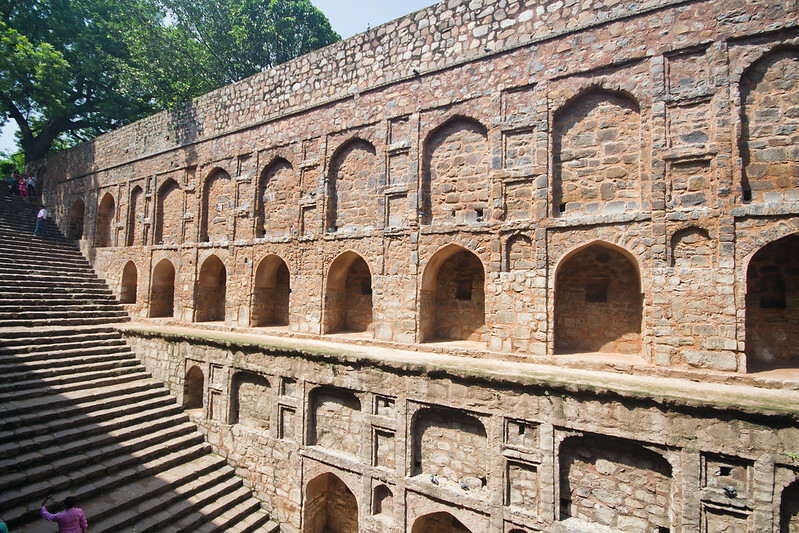 When India fell under British rule, appalled by the sanitary condition and lack of hygiene provided at these step wells, authorities built pipe and pump systems to replace the stepwells. In fact, this stepwell sat mostly forgotten for years until a famous movie, PK starring Aamir Khan, came to film at this location. Another reason why people tended to stay away from this particular stepwell were reports of it being haunted. Legend says that it was once filled with black water which enticed people to jump in and commit suicide. Today, the well itself doesn’t contain much water and is, instead, filled with bats which adds to the supposed eerie atmosphere. I didn’t feel anything odd during my visit, but I also was too lazy and hot to walk all the way to the bottom of the stepwell. 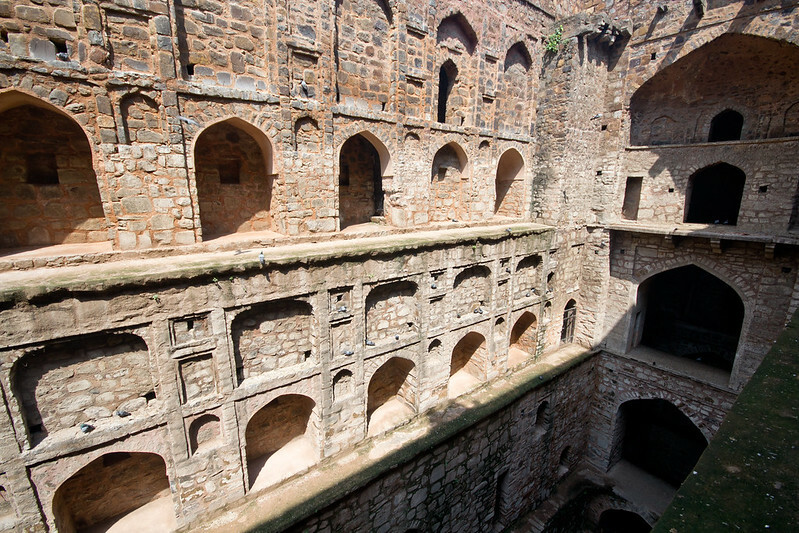 How the Agrasen Ki Baoli came to be in existence is a bit hazy. The structure’s architectural style is that of late Tughlaq (1321-1414 AD) or Lodi (1451-1526 AD), but it is believed that it was constructed by Agrasen, a legendary king believed to be a contemporary of the Hindu god Krishna with 3124 BCE as a birth date. 108 steps lead you down to the well. Its side walls are filled with recesses and arches which photograph beautifully. The location is great for some unique photos and I even saw someone getting some vacation photos taken similarly to my experience with Localgrapher in South Korea. I visited early in the day, shortly after it opened and while there were a handful of other groups there, I have heard reports of it filling up with visitors and locals which take away from the atmosphere. 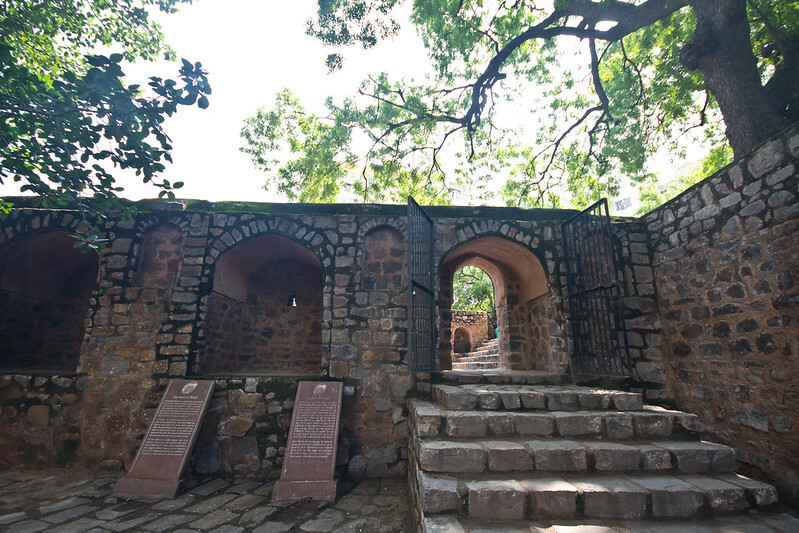 Entrance into the stepwell is free and is typically open from 9 am – 5:30 pm every day. Photos don’t do this place justice. It just has to be seen to really appreciate its architecture and how impressive it is. 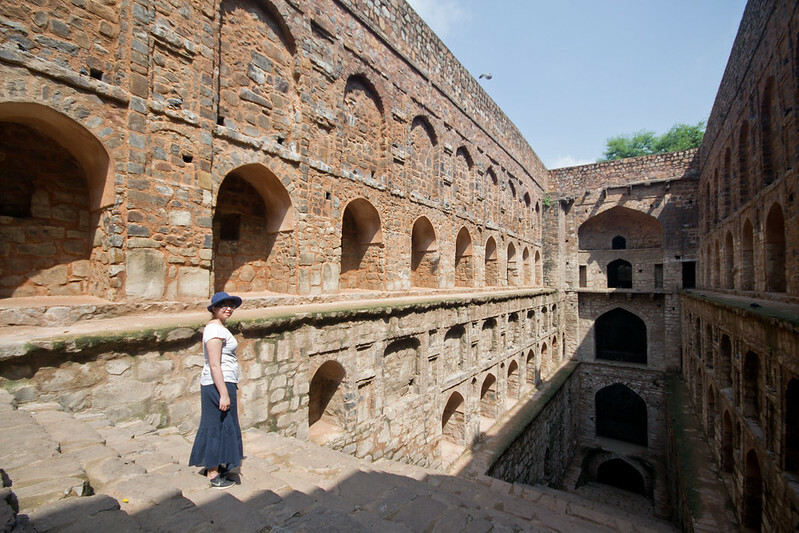 If you find yourself in New Delhi, or anywhere in India really, be sure to seek out a stepwell to two. 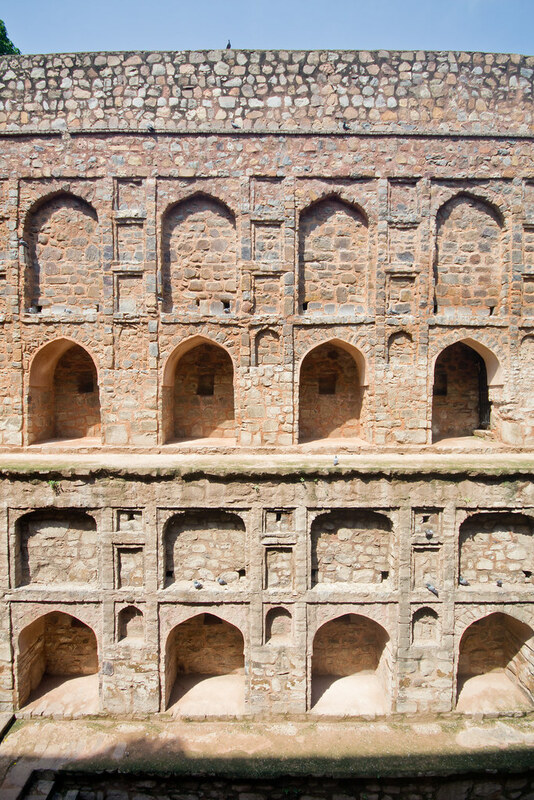 The Stepwell Atlas is striving to map these structures and can help you in your search to see these in person. Have you seen a stepwell before? What other architectural surprises have you discovered on your travels? P.S. After some digging on the internet it appears that in Season 2 of the Amazing Race Australia visited this same stepwell. While I watched all the different iterations of the Amazing Race, I seem to remember it was the U.S version that went, but I can’t find it anywhere. I guess my memory is wrong! Now that I’ve seen the one, I want to see them all. Such cool places! How did I miss this? This is amazing. Now I need to go back and visit again! It is, isn’t it?! I hope you get a chance to see it for yourself! ok well i should be in delhi next year. ive been before but never heard of this place – I must visit it! thanks for sharing! That was funny. My first thought at the title was “What’s a stepwell?” Then I saw the photo and thought “wow, that looks incredible!” I’d love to visit there someday. The history of the place is really interesting. I would never have thought a place like this exists if I hadn’t read your post – or if I had actually watched The Amazing Race as I’ve been recommended to do. Thanks for this, and I’ll be sure to keep it in mind when I finally make it to India. It looks so much cooler in person too. I hope you get a chance to see it! It’s so close to so many other sites too! Hopefully, you get a chance to see it if you head back to Delhi! I’d never even heard of stepwells until this post, but this looks amazing! The architecture is very fascinating and unlike anything I’ve ever seen before. I’m definitely going to have to look up more stepwells and maybe even add a few to my bucketlist. This one is going on my list for sure! Thanks for giving a little background too. The idea that it’s “haunted” and had “black water” makes it even more fascinating! I hope you get a chance to visit one! They’re so cool! 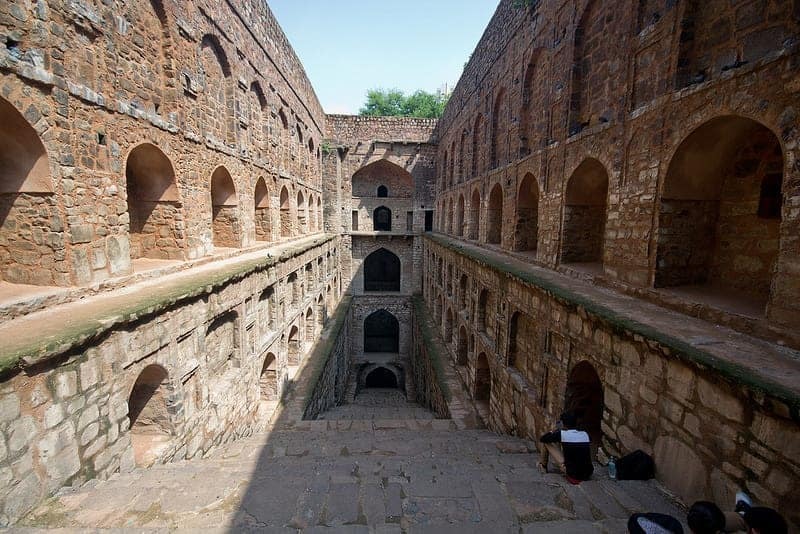 I am from Delhi and have visited Agrasen Ki Baoli several times. This place is an architectural Marvel and photographers delight too. It has never disappointed us neither we have ever felt any unusual activities there. Glad that you enjoyed the place.